The truck mount hot water extraction carpet-cleaning machine is, hands down, the most powerful, efficient and effective machine for cleaning your carpets. Since all the solution tanks, cleaning products and waste tanks are mounted on the vehicle, there is no need for exterior power or water source to carry out the cleaning operation. All the dirty water containing the soil is vacuumed into the waste tank mounted on the vehicle. Keeping all of the water outside of your house means no mess or spills from filling or emptying the machine and our technicians will only bring in clean hoses into your house – less equipment in your house definitely makes for a faster and more efficient cleaning! One of the most important advantages of our truck mount machine is its ability to produce some serious heat. The powerful engine heats the water and cleaning solution that runs from the truck to the carpet in your home. It can heat water up to temperatures of 230º and keep it that hot! Hot water is vital for effective carpet cleaning. Hot water speeds up the chemical reactions between the cleaning solution and the soils in your carpet. Very hot water also helps break down soils better than warm or cool water. Rinsing the carpet with hot water dissolves the soils more effectively. Another important advantage of truck mount carpet cleaning machines is their unequalled vacuum power. Truck mount machines can move a lot of liquid quickly and this means they can remove a huge amount of moisture from the cleaning process. Removing a lot of water helps to minimize the drying time for your carpet. Small enough to be wheeled around and carried, the portable hot water extraction machine is just like it sounds, portable. We use portable carpet cleaning machines at Amazing Results in hard to reach places as well as in condo buildings where hoses from an outside machine cannot reach. 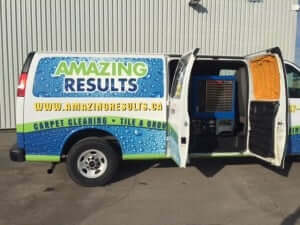 No matter which method we use at Amazing Results, you can be sure that we will provide you with a positive carpet cleaning experience. Contact us today, You’ll be Amazed! A carpet cleaning business is rather detailed. I’m not sure of your experience, but you’ll have to know a lot about stains and how to properly treat them and such, also what best to use on what types of carpets. The ones connected to vans are much more convenient for doing a lot of houses throughout one day. As far as best , you’re not really comparing apples to apples if you’re talking about a basic smaller one coming from a department store.